Your timing belt replacement cost will vary depending on a number of factors, including the year, make and model of your car along with the service shop you choose. While the cost of the belt itself is negligible, it takes a skilled and certified mechanic to perform the installation. For a car, the average price lies somewhere in the $300 to $500 range, while truck and SUV owners can expect to pay $700 or more. Most of the cost associated with a timing belt replacement will cover the labor involved. Think You Might Need a Timing Belt Replacement? Use our Automotive Repair Estimator to get fast and easy estimates from reputable and affordable repair shops in your area. The total cost of a timing belt replacement will depend on a number of factors. These include the make and model of your vehicle and the type of timing belt you select. The belt itself can cost from $20 to $50. Labor for installation is based on the size of your car. Small cars cost from $300 to $500 for the average timing belt replacement. Large SUVs or minivans cost approximately $700. At the highest end, you might need to pay up to $1,000 for a timing belt replacement. The vast majority of the cost is based on the actual labor involved. To access a timing belt, many engine components need to be moved. While the belt may cost $50, the repair takes a few hours to accomplish. Because timing belt replacement is tricky and complicated, the repair should only be performed by someone with the proper training and tools. The timing belt of an internal combustion engine is responsible for synchronizing the operation of the crankshaft and the camshaft to allow the valves of the engine to open and close at the proper times for intake and exhaust. Timing belts are often toothed on the inner surface for efficient operation. In some designs, the timing belt is also responsible for driving the water and oil pumps of the engine. Timing belts are typically covered with a metal or polymer belt cover to protect them. These covers must be removed to permit inspection or replacement. The replacement schedule will depend on the recommendations of each manufacturer. When a timing belt is replaced, the movements of the valves and pistons must be carefully synchronized to prevent incorrect valve timing. In extreme cases, improper synchronization can lead to a collision between valves and pistons. Most drivers should consider having their timing belt checked out once the vehicle exceeds 40,000 miles. However, some cars can go 70,000 miles or more before needing a replacement. Failure to replace a timing belt per manufacturer's directions can result in breakdown or complete engine failure. The timing belt tensioner is often replaced at the same time. Timing belt failure is usually the result of stripped teeth or delamination/unraveling of fiber cores. Because of the high tensile strength of the fibers used in the manufacture of timing belts, failure from breakage is not common. 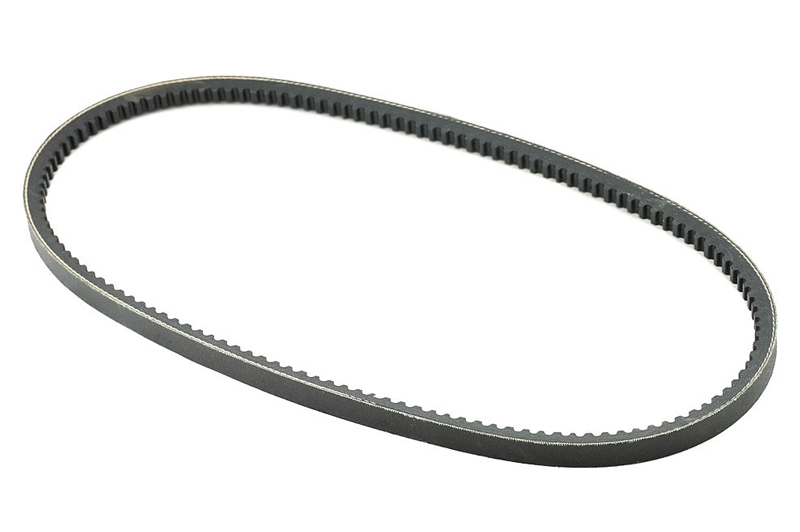 A timing belt is usually made of rubber with fiberglass or Twaron/Kevlar. Because rubber degrades in high temperatures and after contact with motor oil, the lifespan of a timing belt is substantially decreased in engines that run hot or that have a tendency to leak. The fiberglass reinforcement cords are extremely sensitive to water and antifreeze. In off-road applications, care must be taken to ensure that water can sufficiently drain away from the belt to prevent premature failure. Newer belts are made of a temperature-resistant material to help them better withstand engine heat. Most vehicle manufacturers recommend that you replace your timing belt every 40,000 to 60,000 miles. In areas of extreme temperatures, you might need to replace the belt more often. You should ask your mechanic to inspect your timing belt occasionally to make sure that it is in good condition. Look for cracks, chips and missing ribbing along the length of the belt. If you notice any problems, take the car into a professional automotive service shop as soon as possible. As a timing belt wears out, it will start to produce a high-pitched shrieking or whirring sound. This sound is especially pointed when starting the engine. If you think you hear any unusual sounds, open the hood of your vehicle and look inside while the engine is running. If you cannot determine what is making the sound, head to the nearest garage. Oil and coolant spots on the timing belt are indicators that the belt is nearing the end of its life. A "healthy" timing belt will be free of spots and other signs of wear and tear. If you have trouble starting your vehicle, your timing belt could be to blame. While there are many potential problems your car could be experiencing, an old timing belt is among the most likely trouble spots. If your mechanic finds plastic fragments inside the oil pan, this is a sign of real trouble. The timing belt operates the camshaft gears. When the belt's timing is off, it can break off pieces of the camshaft and cause them to fall into the oil pan where they will cause loss of oil pressure. Low oil pressure will eventually lead to engine failure. Glazing occurs when the belt has a glossy finish to the underside. A glazed timing belt no longer has the flexibility necessary for efficient operation. An auto mechanic will check for glazing by attempting to put an indentation into the surface of the belt. If no mark can be made, the belt needs to be replaced. Before you agree to have your timing belt replaced, ask your mechanic whether he offers neoprene or EPDM belts. If he offers both, request an EPDM belt. EPDM stands for ethylene propylene diene monomer. This material performs better than neoprene and rarely shows signs of wear at close to 100,000 miles. When considering timing belt replacement cost, you may want to go ahead and replace other components operated by the timing belt. These include the water pump, front engine seals and the pulleys and tensioner. These parts are inexpensive compared to the labor required to access the timing belt. Having them replaced at the same time will save you money in the long run. The key to getting the best price on your timing belt replacement is choosing a reputable and honest automotive service shop. Blitzifymakes it easy to comparison shop for mechanics in your area. We’ll use our auto service cost calculator to help you find the best price in your area. Get a quote in seconds. That means no more calling around to every shop within a ten mile radius of your home. Get the bottom-line information you need without the hassle. Every day we help countless car owners just like you find a great deal.